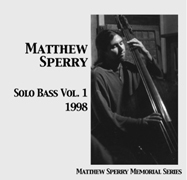 Yesterday was the first anniversary of the death of our friend, musician Matthew Sperry. Matthew was run over by a pickup while on a bicycle on his way to work, leaving behind his wife and two-year-old daughter. 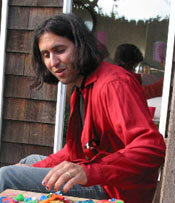 His premature death sent waves of shock and sadness through our circle of friends, which resonate with us still. His daughter Lila is three now, and is beginning to better understand and articulate her daddy’s absence in sweet but chilling ways. His wife Stacia is coping as best as could be hoped, but is still suffering from his loss. A large circle of Matthew’s friends gathered yesterday in the beautiful columbarium where his ashes lie. The bow from his bass was passed around as a “talking stick,” and people took turns memorializing him in words — so many different angles on his passing. It was truly touching. Matthew’s musician friends performed mournful pieces in the resonant, sun-filled chambers of the Chapel of the Chimes. Afterwards we gathered at Stacia and Lila’s house to eat, talk, and remember. We love you, Matthew. You are missed. So missed. Blessings.